Conceptual artist Mel Chin’s installation planned for Times Square, New York City this summer is designed to provoke thinking on issues of climate change from the millions who will see it every week. Chin is known for the broad range of approaches in his art, including works that require multi-disciplinary, collaborative teamwork and installations that include cross cultural aesthetics with complex ideas. UNC Asheville students have been working since August with Chin, the university’s Black Mountain College Legacy Fellow, to bring his ideas to fruition. Unmoored, a mixed reality artwork projecting the impact of rising sea levels on NYC, developed by Chin in collaboration with Microsoft, has elements and concepts prototyped by new media students. And Unmoored will be paired in Times Square with Wake, a giant animatronic sculpture. The Wake installation is boat skeleton with a much-larger-than-life figurehead of Jenny Lind, the 19th century opera singer, who’s story was also recently featured in a subplot of the film The Greatest Showman, starring Hugh Jackman. The central focus of Wake is the giant animatronic Lind figurehead. The Lind figurehead would look around at the devastation depicted in Unmoored, a future New York City impacted by climate change, and respond by looking down and emitting a sigh. Laura Bond, a physical emotion regulation expert and Professor of Interdisciplinary Studies and Drama, was invited to work with the mechantronics team to help them find a student who could depict the expressions for the Lind figurehead. In an early planning session, Bond asked Chin about the specific emotions he was hoping to depict with the sigh and head movements. She then worked with Drama student Kelsey Hamilton to practice and demonstrate through video samples the subtle breathing and head movements possible in the expressions of such words as downcast, forlorn, solemn, sorrowful, despairing, defeated, woeful, crushed, ashamed, and regretful. Chin chose some of these words and expressions from the samples and Bond and Hamilton practiced for the day when the mechantronics team would capture a final recording of the head movements and breathing patterns associated with the emotions. 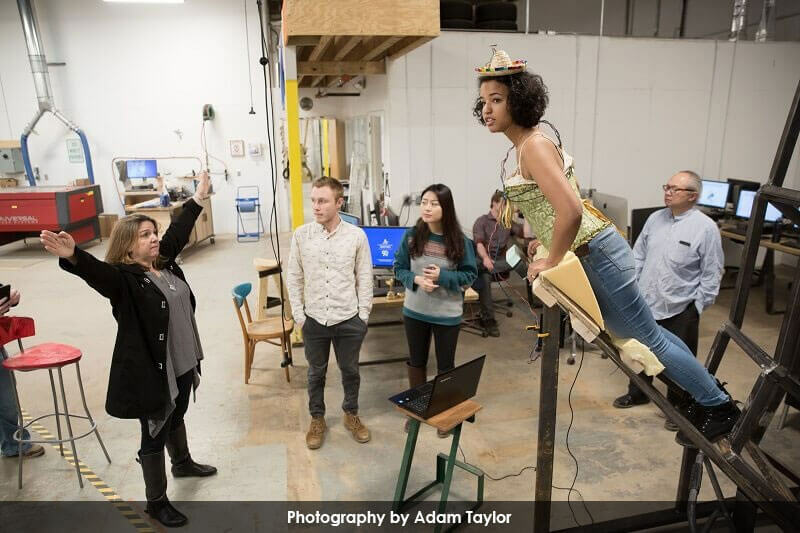 Seven mechatronics engineering students, along with art student Jeb Hedgecock, the Black Mountain College Legacy Intern, worked under Chin’s direction to construct the giant figurehead in UNCA’s STEAM Studio. To augment the figurehead’s emotional impact on Times Square viewers, Hamilton’s breathing and motion patterns were programmed into the software and machinery that controls the figurehead’s movements, thanks to the 3D tracking hardware and software developed by engineering students Kaitlin Thomas and Elijah Nonamaker. On the programming day Hamilton wore a corset, to replicate the garment style Jenny Lind wears in that time period. This would accurately redistribute her breathing higher up, forcing her to breathe more in the high chest area, a typical response when wearing a corset. Hamilton was also mounted on specially built structure, placing her high off the ground and leaning at a steep angle, to model the exact body position of figurehead, and thereby affecting her motions and embodied expressions when looking out on the scene. Hamilton’s “costume” also consisted of 3D tracking devices wired to her hat and taped to her body in order to detect her breathing pattern, and head and neck movements, which were all documented in a computer program. Once Chin described how much head movement he wanted, and described a specific pace for the expression, Bond directed Hamilton through the process of movements and emotional expression, while the mechatronics students recorded Hamilton’s expressions into the computer. A junior from Winston-Salem, Hamilton hopes to be a film actor and she has been working with Laura Bond on applying emotion regulation in her acting work. “The method uses breath patterns and muscle triggers in the face and the rest of the body that work together,” said Bond. “They’re emotional effector patterns discovered in scientific research that physically, biologically trigger emotion in our bodies.” Hamilton has been studying more advanced physical emotion regulation methods this year under Bond’s guidance in an undergraduate research course where students are exploring the subtleties of subjective and mixed emotional states for stage and film acting. Chin’s installation is slated to debut in Times Square on July 11. In the meantime, New York City’s Queens Museum is currently hosting All Over the Place, a major exhibition of Chin’s decades of work.